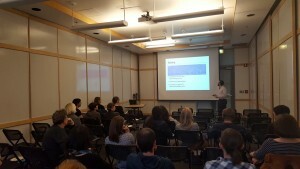 Last week, WCS-UW and Free Radicals/PLU hosted a panel for undergraduates interested in applying to graduate school. Professors Rob Synovec (UW chemistry associate chair for graduate education) and Brandi Cossairt (member of the UW chemistry admissions committee) provided an administrative view of the application process while several graduate students shared their personal experiences. Thank you to all the of panel members and those who attended the event; it was a great way to start off the year! This entry was posted in Events, Undergrads on October 27, 2015 by EShelton. Level Up! Moving on to Graduate School: This guide and worksheet (written by Olivia Lenz, UW materials science & engineering graduate student) walks through the entire grad school application process, from choosing where to apply to accepting an offer. UW Office of Merit Scholarships, Fellowships, and Awards: While this office focuses on scholarships and fellowships, they offer workshops and materials to help with writing personal statements, building a resume or CV, and asking for letters of recommendation – all of which are also relevant for grad school applications. American Chemical Society: The ACS provides several chemistry-specific resources, such as this “Planning for Graduate Work in Chemistry” guide, as well as more general links. The ACS Directory of Graduate Research: This database includes a ton of information on chemistry professors and departments, and is searchable by research field, location, and gender. It’s a great place to start looking for potential research advisors. Trends in Ph. D. Productivity and Diversity in Top-50 U.S. Chemistry Departments: An Institutional Analysis: This study, published in the Journal of Chemical Education in 2014, includes lots of interesting data about department size and representation of women and underrepresented minorities in Ph. D. programs over the past few decades. The University of Washington ranks #2 among these departments in the percentage of Ph. D. degrees granted to women between 2005 and 2009! The Grad Cafe: The blog posts and discussion forum on this site offer perspectives from all different fields, from both prospective and current grad students. There’s also a database of grad admissions decisions to help figure out when you might hear back from your programs. The Princeton Review and U.S. News & World Report both provide a lot of general information on the grad school application process, as well as program rankings – but don’t take the rankings too seriously! There are many different ways to rank programs, and individual experiences and outcomes vary a lot within each program. Feel free to add your own links in the comments, or email us at wcsuw@uw.edu! This entry was posted in Undergrads on October 20, 2015 by Heidi. Attention, physical science undergraduate students who are applying to graduate school! Would you like to get helpful feedback on your personal statement or other parts of your application? Several current graduate students and WCS members have volunteered to read and provide feedback on grad school application essays. Whether you need help with putting together a cohesive story that will stand out to the admissions committee, making yourself sound awesome, or just proofreading and grammar, we’re happy to look over your essays and answer your questions. We’ve all been there, and now we want to pay it forward. To get feedback on your essay, just email it to wcsuw@uw.edu. Feel free to include any other information (e.g., where you’re applying) or questions as well. If you’d prefer to remain anonymous, please specify that in your email, and we’ll make sure we remove your personal information before sending your draft to a grad student. Otherwise, we’ll connect you directly with a grad student (or two) and you can choose to discuss your essay via email or meet up in person. We’re also hosting a graduate school application workshop on Tuesday, October 20th at 5:30 pm in CHB 102! This event is co-sponsored by Free Radicals/PLU, the undergraduate chemistry club. Professors Rob Synovec (director of the UW chemistry graduate program) and Brandi Cossairt (member of the admissions committee) will provide the admissions committee’s perspective on what makes a good application, and a panel of current graduate students will discuss how they made their applications successful. Pizza will be provided. If you can’t attend the workshop, you’re still welcome to submit your personal statement for feedback. We’ll also post tips, tricks, and resources from the event here next week! This entry was posted in Events, Undergrads on October 13, 2015 by Heidi.